The cast of "Sweat." Courtesy Pioneer Theatre Company. Netflix bingers and bookworms normally say that art acts as a needed escape from reality. As art begins to more accurately imitate life, though, the digestion process can eat at us. 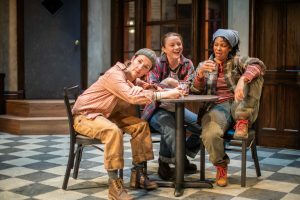 Lynn Nottage’s Pulitzer Prize-winning play “Sweat” is one such piece. If the play — hardly ignoring any temper of the current zeitgeist — was not so beautifully rendered and achingly real, the performance would be nearly unbearable. At Pioneer Theatre Company, Mary B. Robinson directs her second Nottage play, having previously directed “Intimate Apparel” at Westport Playhouse. “Sweat” follows an unusually large cast of main characters, balanced through their complex connections to one another. Set in Reading, Pennsylvania, the play alternates between the beginning of the millennium and 2008. Chronicling the mounting tension the working class experiences at the threat of losing the only job they have ever known, the play explores class, gender and ethnic influences on the American dream. While alluding to a crime committed by two of the youngest characters, sons of two of the female factory workers, the play builds to the explanation of how prejudice and desperation landed them in prison. The majority of the action takes place inside of a bar run by an ex-factory worker, permanently crippled from an accident. He acts as a mediator for many of the characters, and his bar acts as a pressure cooker as voltaic confrontations build from scene to scene. His Colombian assistant, at first quiet, begins to come into the foreground of the play as the characters see him as the representative of a group responsible for taking their jobs. 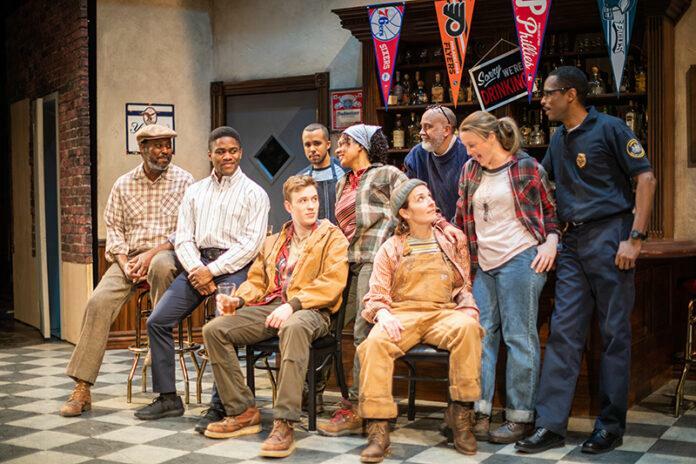 The play examines both sides, painting the frustration of the factory workers while laughing at the conservative double standards and generalizations harbored towards perceived outsiders. The resulting tragedy leaves the audience sympathizing with every character, and the entire story is bold enough to unflinchingly expose cruelty while still humanizing everybody. Susanna Florence, Margot White and Nafeesa Monroe in “Sweat.” Courtesy Pioneer Theatre Company. Everything about the performance feels intentional and smart — as each actor immerses themselves in their characters, the cast seems to be on the same wavelength. The rich personalities expressed through this cast are delightful. They create diversity through their unique portrayals and still remain cohesive in their nuanced performances. The actors demonstrate how restraint often provides some of the best tension. The subtle unease keeps the audience engaged and in constant suspense, especially because the tension delivers explosively in the constrained setting time and time again. The bar begins as a place of unity and celebration that, by the end, serves to trap characters together and highlight economic strain. Scenic designer Jason Simms creates a sprawling and vivid landscape through the central bar, at once breathable and spacious yet constricted enough to remind the audience of the choking hold of each scene. The scenes that take place in the future are barren by comparison, conveniently and appropriately letting the past appear more vital and hopeful. And because not every play gives an opportunity to comment on fight choreography, it would especially be a crime not to mention the convincing brutality created by Christopher DuVal, who also plays the bartender, Stan. Even up close, the violence felt real enough to make me turn away. This urgent story and brilliant dialogue by Nottage has done justice through the consistent excellence of the performers and the obvious expertise of the director and designers. If you have the chance, see this performance. Be astounded by the skill of these artists and reminded of our current condition. “Sweat” will be showing at Pioneer Theatre Company until April 13. For ticket information, visit pioneertheatre.org.